CHINA - Last week, Genesus was at Eurotier. The Genesus presence was split over two booths with our European partners, JSR Germany and Pork-Ex from Denmark. Both booths were constantly busy with a flow of existing customers, new customers, and industry friends. Pig producers are cashed up and looking to expand, writes Alexander Kovachevich, GM China Area. This week, Chinese slaughter prices are slightly down over last month, but at $2.31 to $2.39 USD a KG over the whole country, producers are still able to make an impressive $100 USD* a market hog. Earlier in the year, this commentator often heard Chinese producers worried about an imminent fall in price. I am now hearing a more confident tone with the general feeling that prices will stay firm for most of 2017. After all, almost 5 per cent of China’s breeding stock was culled in 2015, and it takes time to get back to a supply demand equilibrium. While pig producers are doing well and want to build new barns, the Chinese environmental department is turning its attention to soil and in particular water pollution. Getting a pig production permit has become extremely difficult unless an acceptable manure treatment plan is presented. Simply draining your barn’s manure into the local river or pond is no longer acceptable. In the past, most people in and out of China thought of the choking smog, as often photographed in Beijing, as the worst of China’s pollution issues. However, water and soil pollution are equally severe and are much harder to remedy. It was not surprising to see that all of the larger equipment providers and some specialty companies in Eurotier have a manure handling section, and I suspect that this technology was the one that the majority of Chinese visitors to Eurotier were paying the closest attention to. In general ‘Mum and Pop’ farm operations are given more leeway when it comes to environmental compliance. However, this is becoming less the case and the demand for a low cost manure treatment solution will be huge. It makes producers think more about efficiency, getting more piglets (pork) out of the same space and number of sows. That’s where the benefit of using Genesus genetics comes into play. 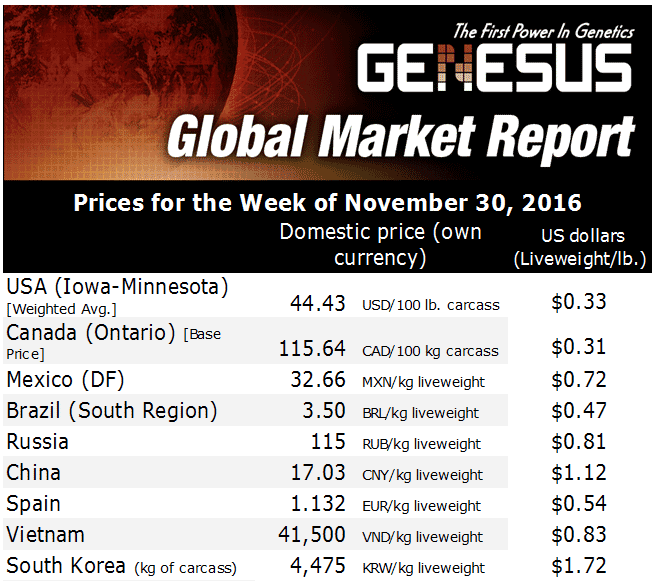 Genesus is the ‘Total Package’, with the Genesus 4 TON SOW -BECAUSE- 30.58 hogs sold per sow x 276 lbs per market hog = 8,440 lbs sold a sow, which means each Genesus sow produces over 4 American tons of pork! 1.85 A.D.G. wean to finish - 2.489 feed conversion. The current market situation is looking good for people with pig-filled barns. As the winter approaches, barn building has stopped in the north of China and we can expect pork prices to increase, mainly due to greater demand caused by colder weather and holidays. But if the winter is as cold as predicted, then supply issues will cause additional rises in the price of pork. Happy Days for Pig farmers in China, but perhaps the happiest are the farmers with the 4 TON SOW.